For this month’s Secret Recipe Club I was paired with Stephanie from Dessert Before Dinner. I find a bit cruel to be assigned to two sweet blogs (last week it was Annie’s Noms) just before and in the middle of my first Whole30. A true test of strength indeed! But none the less, as soon as I could again eat real foods, I couldn’t wait to indulge with one of Stephanie’s recipes. 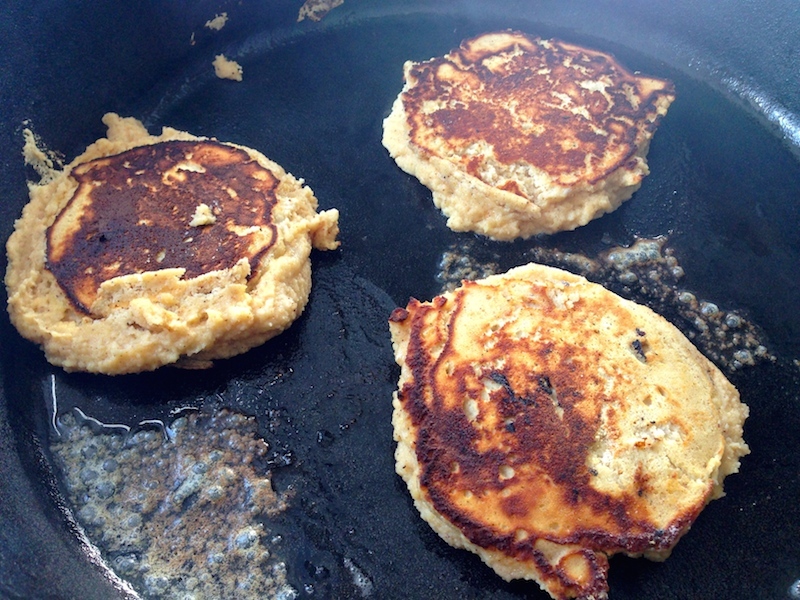 After eating eggs for breakfast for a month, I was immediately drawn to her Coconut Flour Pancakes. This recipe is ridiculously easy and makes a generous portion for one, or two smaller portions if you’re willing to share. 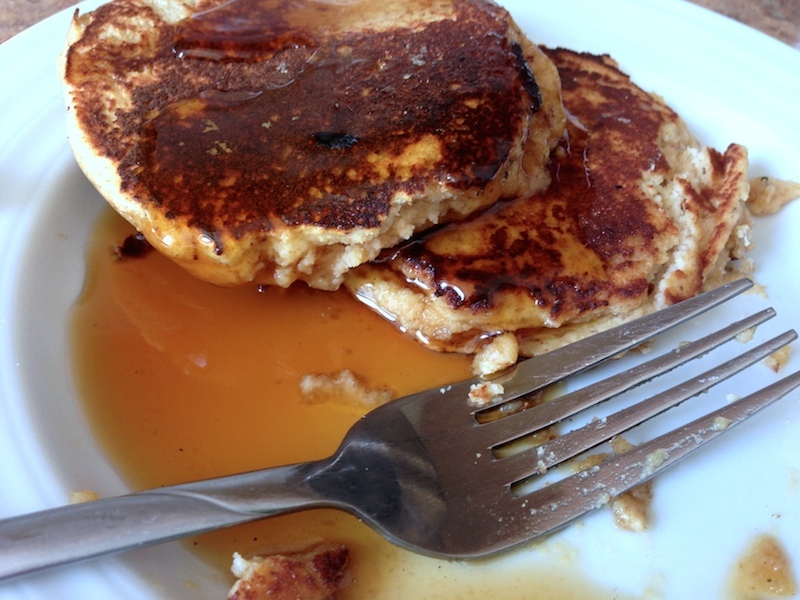 Pancakes have always been a weekend indulgence for me. They take time to make, require me getting out the griddle–a lot of effort all around. But these. These pancakes are just brilliant. Quick to mix, easy to cook in a cast iron pan, hard to not devour in 5 minutes. In a small bowl, whisk together eggs, milk, cinnamon, nutmeg, cloves and honey until well blended. Whisk in coconut flour to combine. Heat butter over medium heat on a large skillet or cast iron pan until melted and foaming. Drop pancakes onto skillet, flattening out the batter as much as possibly (otherwise the insides won’t cook!). Flip after 2-3 minutes when pancakes start bubbling. Cook an additional 2-3 minutes on the second side. Serve with pure maple syrup. Yum! 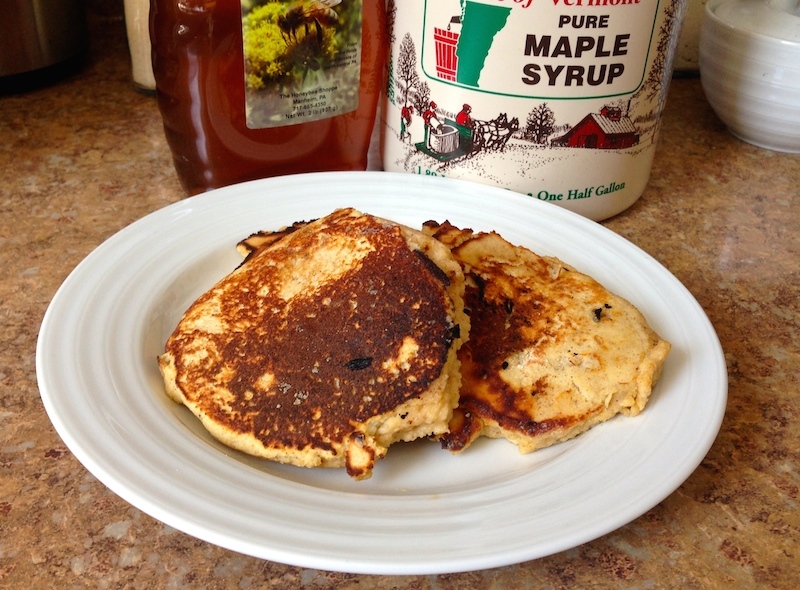 Gotta try pancakes with coconut flour! Sounds sooooooo good! Thanks Debbi–they were refreshingly easy and hearty. A bit like buckwheat pancakes. These were super easy and quite impressive. I was never a big pancake fan but going GF and NOT being able to have them has created cravings. This fits the bill! Thanks Laura! I haven’t tried coconut flour in cakes yet, actually haven’t used it much of anything but this has made me a coconut flour believer. I always hesitate to fix pancakes just for me. Love them but so high in carbs. I think these would be perfect for my next Sunday Breakfast. I love this recipe because it doesn’t force you to make a lot. I have the same feeling and when I do occasionally make pancakes, feel forced to eat them all or as leftovers for the next few days. This allows for a single indulgence.